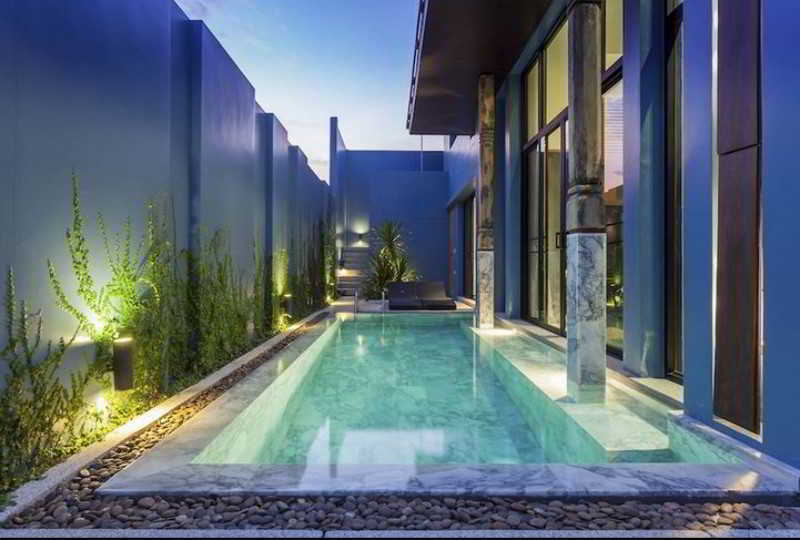 A stay at these villas is one of the smartest ways to enjoy affordable accommodation with a luxury private swimming pool on the coast of Phuket Island (southern Thailand). These holiday homes are in enclosed premises where guests can make the most of all the conveniences of resort-style services while on holiday. Visitors can arrange to be picked up from Phuket International Airport and transported directly to their freshly prepared villas. Guests are provided with a mobile phone on arrival to enable them to contact services at any time or make a local call and Wi-Fi is complimentary, and a shuttle service to the nearby beach and stores for shopping trips is also laid on. The modern apartments all have a fully-equipped kitchen with cooker, microwave, fridge, kettle, toaster, complete set of crockery and cutlery, etc., an en-suite shower and a balcony. 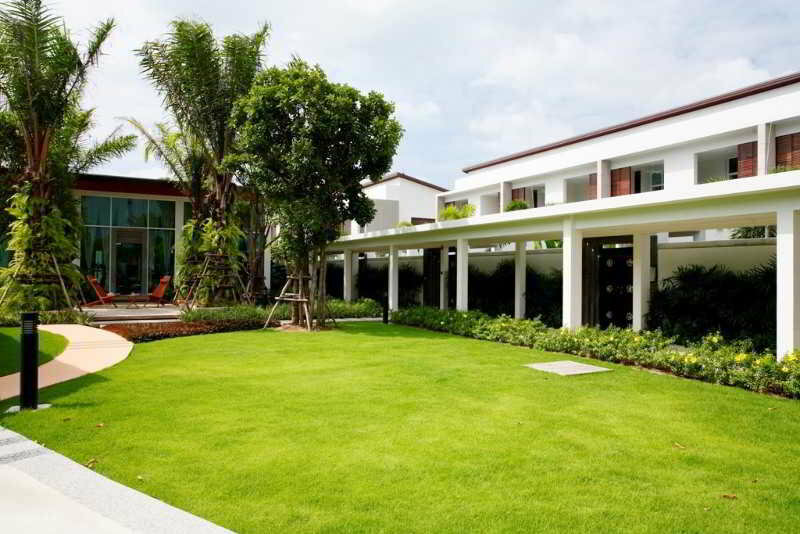 This villa complex is located in the tranquil Soi Koktanod community, adjacent to the Laguna area. Its guests can enjoy a peaceful surrounding that is just a 10-minute walk from famous tourist attractions such as Layan Beach, Bang Tao Beach and Surin Beach. Near them they can find excellent shopping and dining venues and Phuket town centre is just 3km away. The self-catering private pool villas are perfect for holidaymakers who wish to unwind with their friends or family, but require a little more independence from what the traditional venues can provide. Each unit is furnished with Thai contemporary style and include a spacious living area fitted with a home entertainment system and a large-screen TV. The balcony leads out to the relaxed garden where guests can dine with their homemade meals and some excellent drinks. This resort is just 3 minutes from Bangtao Beach and right next to the aquarium, as well as 10 minutes from the Phuket Fantasy Show. 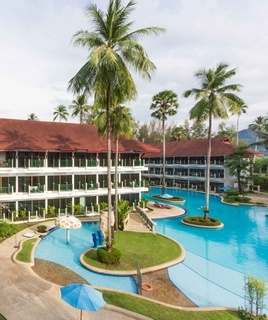 The nearest shopping centre is 10 minutes away and it is 15 minutes to Patong Beach, and 30 minutes to Phuket Airport and Phuket town.This club resort was renovated in 2006 and offers guests 28 Thai-style villas each with private balcony. The accommodation enjoys a unique quiet setting in a garden next to the beach, and is ideal for those seeking relaxation. Facilities on offer to guests include a 24-hour reception, a hotel safe, a bar, a restaurant, room and laundry services and parking (additional fees apply).The rooms are situated in separate buildings set in a peaceful area, next to the pool. They all come with a private en suite bathroom with a shower/bathtub and a hairdryer. Furthermore, satellite/ cable TV, a minibar, tea and coffee making facilities, a washing machine, an ironing set, a king-size or double bed, individually adjustable air conditioning, a safe and either a terrace or a balcony are provided as standard.The resort features a private swimming pool with sun loungers, a children's pool (additional fee applies to use of both) and a Jacuzzi. Guests may also relax with a massage, and the Banyan Tree golf course is only a 10-minute drive away.Breakfast is served from 6.30 am until 10.30 am and is available in buffet form or to order. The midday and evening meals may be enjoyed à la carte or from a set menu.This resort is situated just 30 minutes from Phuket Airport along the main road. 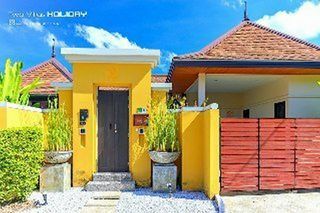 This stylish complex provides a choice of self-catering private pool villas on the beautiful Phuket island, just 45 minutes south of Phuket’s international airport. Guests can take advantage of this convenient situation as the property is just a 5-minute driving distance from some of the most beautiful beaches in the area, including Raway, Nai-Harn and Bang Tao beaches. The completely equipped villas feature a prime situation among lush tropical gardens and come with all the necessary services and amenities for guests to enjoy a truly comfortable stay. Visitors can take a cool dip in their private swimming pool or enjoy an invigorating workout in the onsite fitness centre. There is a complimentary schedule shuttle bus for guests to reach nearby beaches. This luxurious property is translated as "evergreen land" and that is precisely what guests will find at the hotel. 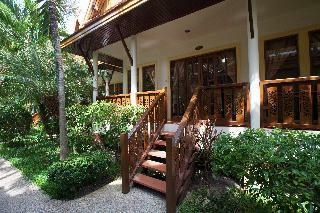 It is situated in a convenient yet secluded part of Phuket, close to Layan Beach. Clean lines and a contemporary feel, calming views of nature together with a few comforting amenities will create an unsurpassed holiday experience. Filled with natural light, the hotel used nature as a design element and wrapped the hotel around the outdoors. Walls, windows and sliding doors connect the crisp, architectural lines as well as the surrounding landscape. Guests will find in every room a controlled, intentional relationship to the exterior. The hotel is a tranquil top class boutique hotel insulated from the outside world by lush tropical surroundings. Staying at this hotel is the perfect Thailand holiday experience. The Pavilions Phuket is a fabulous hotel situated in one of the most exclusive area in Phuket, on a hilltop on Bang Tao Bay and sits overlooking the Andaman Sea and lush green valleys. It is also conveniently located approximately 20 minutes from Phuket International Airport. Layan Beach, renowned for its privacy, soft sand and crystal-clear waters, is only 3 minutes away. The hotel boasts spacious and romantic rooms with excellent up-to-date amenities and provides a warm and very professional service. This is an ideal soothing and exclusive retreat for couples and honeymooners. Set against the backdrop of the beautiful white sands and blue sea of Bang Tao Beach, this resort is a unique tropical paradise. 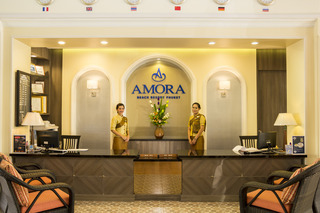 The hotel is around 20 minutes from the airport and 25 minutes from the lively city of Patong. 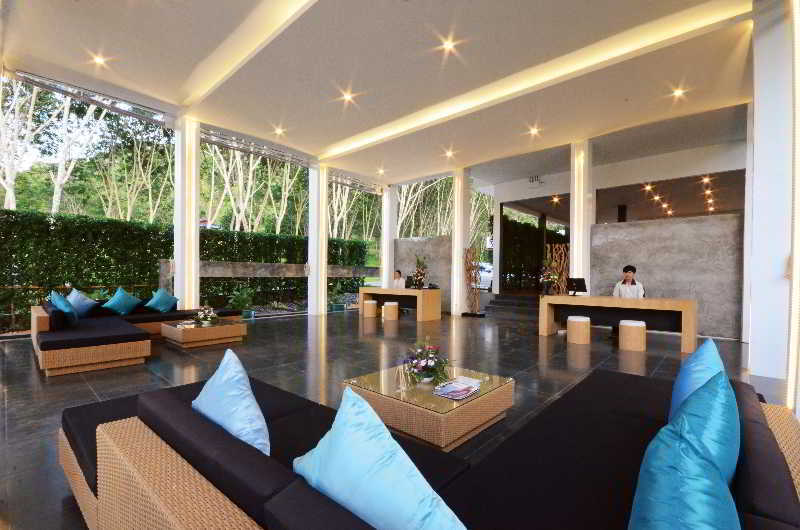 It combines a convenient location, in the middle of Phuket's main attractions, with a peaceful ambience. The establishment offers numerous leisure options and places to visit, most on the island of Phuket and the Andaman Sea. The residence comprises a total of 255 rooms and provides additional amenities. An extensive range of activities is offered to keep visitors entertained. This hotel is a 10-minute walk from Bang Tao Beach, the most sought-after beach in Phuket on the exclusive west coast. Bang Tao is truly spectacular: 6 km of white sandy beaches, crystal-clear warm water and charming local fishing boats. Lam Sing and Surin beaches and the Laguna area are all within around 3 km away. Guests can access nightlife in the tourist centre of Patong, or there is the Red Room restaurant and bar and shopping centres located next to the hotel. It is 20-minute drive from Phuket International Airport. Stylish and contemporary, this hotel is a unique and modern. In the residence resort, there are just 23 villas complemented by a coffee shop, 24-hour reception and a hotel safe. Other on-site facilities include a hairdressing salon, restaurant and WLAN Internet access. Room and laundry services, bicycle hire service and car park or garage are offered. 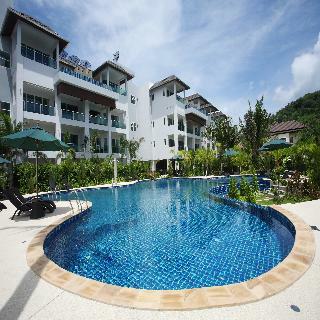 The residence is strategically located on the west coast of Phuket, within the tranquil village of Bangtao. A short 20-minute drive to the hustle and bustle of Patong, it is also within easy reach of many internationally acclaimed championship golf courses. Guests will find restaurants and bars about 10 minutes' walk away in Bangtao, while other nightlife options can be found some 20 km away in Patong Beach. Bangtao Beach is also just 10 minutes' walk away. Phuket International Airport is around 30 km away.The hotel is the perfect choice for guests' dream holiday. It is situated in the heart of Bangtao Bay and comprises 55 spacious and superbly appointed suites. All suites have a luxurious living room and are just a few minutes' walk from Bangtao Beach. It really is a life of luxury. The hotel offers facilities including a lobby with 24-hour reception and check-out service, a hotel safe, currency exchange facilities, lift access, a café, bar and restaurant, WLAN Internet access (for a fee), room service, a laundry service (for a fee) and a car park. Business facilities, a tour counter, and shuttle and taxi services are also available.The rooms offer a range of features, including an en suite bathroom with shower, bath and hairdryer, a double bed, direct dial telephone, satellite/cable TV, Internet access, a minibar and a safe. The kitchenette has a fridge, cooker, microwave and tea and coffee making facilities, and there is a washing machine and an ironing set. Individually regulated air conditioning and a balcony or terrace round out the features.This magnificent resort hotel in Phuket offers all that one would expect of a prestigious luxury hotel, including a large outdoor swimming pool with hot tub, a children's swimming area, spa, sauna, Thai massage, a gym and sun terrace.